For an innovative approach to building design, many architects are increasingly including radius-curved panels in their plans. 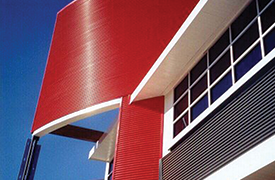 For commercial applications, these panels add a dimension or originality to roof and wall systems, as shown in this photo of the UNLV School of Dental Hygiene. Radius-curved products are also useful for industrial applications, such as arched walkways and conveyor hoods. 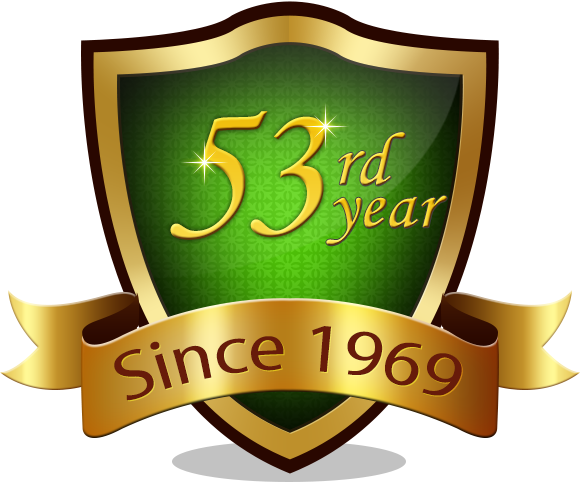 At Flexospan, we can create radius-curved profiles from either our 1/2"- or our 7/8"- products. With its in-house curving mill, Flexospan can create a multitude of shapes. We offer radius curve with a tangent, without a tangent, or with a double tangent. Radius-curved panels can be installed over purlins or solid substrate. Curving by Flexospan results in a continuously smooth, uncrimped curve. It is available to radii as tight as four feet. 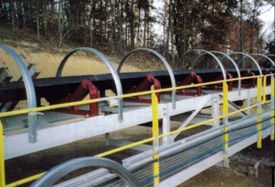 Galvanized Conveyor Cover Hoops eliminates any welding or painting. 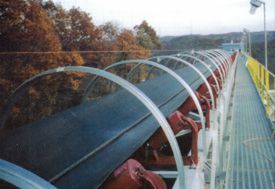 Flexospan's industrial conveyor cover panels are installed easily to these hoops and are available in many colors, steel gauges and types of base materials depending on the application.